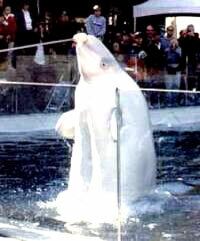 Vancouver Aquarium has 5 beluga whales who also perform tricks for the visitors. Belugas are very special. They can alter their facial expressions and unlike most whales as the neck is so well defined can even turn their heads. They can whistle and are sometimes called sea canaries because they are so vocal. They are stockily built, approximately 10-15 feet long and are white (beluga is Russian for white). They can live for 30-40 years. A beluga whale performs at Vancouver Aquarium. Is this really entertainment? Belugas are found in arctic and sub arctic waters. In these oceans, belugas travel for hundreds of miles. In captivity like other confined animals, belugas can display stereotyped behaviours, such as swimming in circles or figures of eight. In captivity with no environmental enrichment, and acoustically reflective walls, these animals become stressed. Whilst no captures of belugas have been permitted for some years now, between 1967 and 1990 a total of 64 belugas were captured in Canadian waters for captivity. By 1998 over half were dead. Marine Parks are also allowed to import belugas from other countries. Since 1964 approximately 23 cetaceans have died at Vancouver Aquarium including belugas, orcas and dolphins. Write to the Vancouver Authorities, asking that the capture of whales from Canadian waters and their importation from other countries for display in marine parks be prohibited. Also tell the Vancouver Authorities that you believe that in captivity whales live in barren pools that bear no resemblance to their natural environment and that they should free their whales and dolphins after a process of rehabilitation and retraining. Write to: The Honorable Herb Dhaliwal MP, Minister of Fisheries and Oceans, House of Commons, Parliament Buildings, Wellington St, Ottawa, Ontario, Canada.